Do you remember when I was asking for volunteers to host giveaways for my Critter Tales Series? Well, here's one more over at New Life on the Farm. Click here to join in. And if you haven't visited Goatldi's blog yet, please do. She's a homesteader, weaver, spinner, knitter, soapmaker, and goat herder with some lovely livestock guardian dogs. Definitely worth a visit. I have three does due next month. In the past I've bred my girls in late autumn to allow for kidding in the warmer half of spring. With the new barn being more snug than the old set-up, however, I feel a little better about winter babies. Many people prefer winter kidding, because cold decreases the risk of coccidiosis. This is a parasitic infection which can cause severe diarrhea, dehydration, weakness, and death. Goats develop an immunity to it as they grow, but it can kill kids. The protozoa are especially active in warm wet conditions, like spring, hence the tendency of some to have kids earlier in the year. The negative of winter kidding is the potential for hypothermia. If the kids can't be dried quickly and get a tummy full of colostrum, they become weak, lose their sucking reflex, and die. Mama goats will usually lick their kids which helps dry them, but they don't cuddle them to transfer body warmth. First fresheners (first time mamas) aren't always sure where these little goats came from, nor what to think about them. Experienced moms are often busy still having twins or triplets, to give their full attention to each kid as they come along. This is why I try to be there when they kid - to assist with the birth if needed, but also to help get the kids dried off and make sure they are able to nurse on their own. due in February. Here her twin boys show off two of them. Some people use a heat lamp to help warm them. This seems this works best if used in conjunction with a box the kids can go into. I've found that they don't necessarily go to where there's warmth. I've sometimes found them huddled in the coldest corner of the stall, away from the heat lamp. In general a heated barn is not a good idea. Some people worry about keeping their goats warm in winter and so install heating. The problem with this is that without exposure to cold, goats won't grow their winter coats. Then they'll be cold any time they go outside. No good. Of course goats aren't born with winter coats, so to help I've been knitting more baby goat coats while I wait on my approaching due dates. What goats need in winter is protection from damp and drafts. Our Little Barn is snug but not insulated, and I'm finding that unless the overnight temps get down into the teens F (single digits C) then there is no ice forming on the top of the girls' water bucket. Deep litter in the stalls helps. This is a technique whereby the stalls aren't mucked out frequently, but rather straw is added to balance out the manure and waste, which then begin to decompose (like compost) and produce heat. 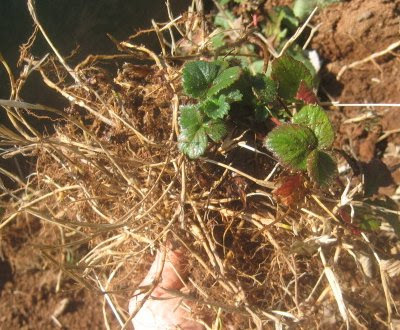 The key is to keep enough straw ("brown" in compost terms) to keep the decomposition ratio correct (30 parts carbon to 1 part nitrogen). "Something that surprised me is that goats don't need high energy feeds (grains) to keep warm during cold weather. Among other nutrients, ruminal fermentation produces volatile fatty acids (VFAs). These provide over 70% of the needed energy supply, enough to enable the animal to stay warm." 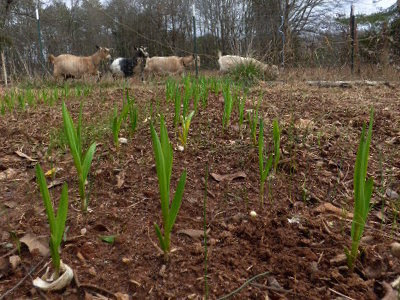 This is part of the "roughage effect," whereby goats create many of the nutrients they need through fermentation of long stemmed roughage. So hay produces energy during digestion, whereas grain requires energy to digest. In other words, too much grain can chill a goat rather than help keep it warm. How many baby goat coats will I need? Including last year's I've got 9 coats so far. There's no way of knowing. Last year I had all singles and twins, but for Kinders, triplets and quads aren't uncommon. I didn't have pregnancy tests done so I can't say for certain that my girls are pregnant. But I'm pretty sure, since none went back into heat after their dates with the boys. And now that we're getting closer I'm keeping an eye on udder development. Lini looks pretty big but Jessie and Violet aren't particularly large, so I'm thinking they'll probably have singles or twins. I have to say though, that Jessie's mom Helen surprised me with quads one year without looking very big. On the other hand, Daphne always looked huge but never had more than twins. I figure I'll just keep on knitting to make sure I have plenty on hand. All of our due dates are for the latter half of next month. VIDEO. How To Make Lye Soap with Constance Beck. The thing I like about videos is that I can see what's going on while it's being explained. This one is a very good introduction to making basic soap, and exclusive to the bundle. A one year membership to MollyGreen.com online magazine (regular price $29 per year). Features articles and product reviews in the areas of HOMEsteading, HOMEkeeping, HOMEschooling, and HOMEindustry. A three-month membership to SchoolhouseTeachers.com ($12.95 per month) is a gold mine of information for homeschoolers. Check out that link for everything they have to offer. This special expires April 22, so be sure to take advantage of it quickly. If you're interested in solar cooking, you will want to look at the offer from Sun Ovens for $133 off their bundle deal. I have one of these ovens (which you can read about here), and I absolutely love it. It's one of those "must haves" for anyone interested in preparedness, off-grid, or green cooking. You also may have heard of Titan Ready USA. Their emergency home preparedness products include the HERC XXL non-electric Oven (cooks with tea candles - seriously! $80 off with B2B Bundle code), the Helius Rocket Stove ($50 off), and their Hydrant Water Storage System ($60 off). I have no experience with their products, but those are some good offers. Seeds for Generations is offering a 20%-off coupon code, and who doesn't like seeds, especially heirlooms! These are the same folks who are offering the Grow More Food eCourse (mentioned above). Do check out their website because they have a lot of gardening resources on offer. Even if you weren't planning to purchase the bundle, do take a look at all the bonus offers, here. If you're already in the market for one of the products mentioned, then the over $800 worth of bundled resources would be your bonus, either free or even more deeply discounted than they already are. PLUS, I'm offering a bonus of my own. If you buy the Back To Basics Living Bundle through my blog, I'll gift you with your choice of one eVolume from my The Little Series of Homestead How-Tos. After you place your order simply email me at 5acresandadream @ mail. com, and let me know which one you'd like. I'll send you a link to download a free copy. I'm a bargain hunter as well as a collector of traditional-skills information, so I think you can see why I am willing to participate in and promote this project. I'm a researcher as well, and can tell you that while there's a lot of free information on the internet, not all of it is worth the time it takes to find it and weed through it. To have a library of good, usable information at the ready is a treasure. Sale ends tonight at midnight. To get it before it's too late, click here. Yesterday I reviewed two of the low-tech and off-grid living resources in the Back to Basics Living Bundle. Today I'll show you some of the "do it yourself" and frugal living offerings in the bundle. My readers know that Dan and I do for ourselves whenever we can, but even so, this year's Back To Basics Living Bundle has some new how-tos for even us. 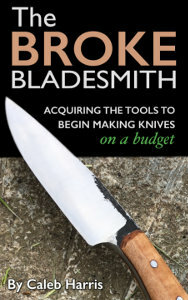 Like this one by Caleb Harris, The Broke Bladesmith: Acquiring the tools to begin making knives on a budget. I love that this book busts the myths of needing expensive professional equipment to make superior quality knives. You'll learn about vises and clamps, hammers and tongs, forges, grinders, the quality of various woods for knife handles, wood shaping tools, how to find an anvil for cheap or free, and where to get steel for knife making. He also discusses shop safety and where to find more information including links to his website and videos. 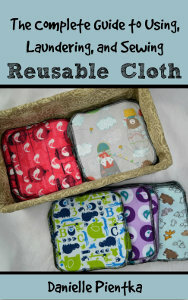 I also like The Complete Guide to Using, Laundering, and Sewing Reusable Cloth Products, by Danielle Pientka. About a year ago I was discussing replacing plastic storage bags in my "Eliminating Plastic: Part 1 - In the Fridge" post. In it I linked to a post on making reusable food wraps. Well, this book is right up the same alley: cloth diapers for children, adults, and pets (well designed ones, including cloth swimming diapers, not just the cloth rectangles I used to use), cloth wipes, nursing pads, unpaper towels, Mama cloths (menstrual pads), handkerchiefs, napkins, wet bags, refrigerator liners, reusable snack bags, and fabric gift bags. The author presents some very convincing arguments for switching from disposable to cloth products, how to make them, and how to clean them (including how to clean without electricity). Includes some nifty storage ideas and a recipe for homemade diaper rash spray. 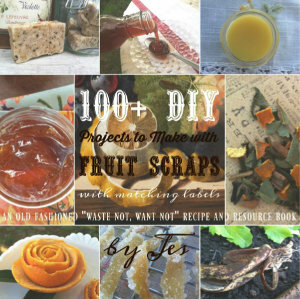 100+ DIY Projects to Make with Fruit Scraps: An Old Fashioned “Waste Not, Want Not” Recipe and Resource Book by Jes will warm the creative, frugal heart in every one of us. This is not simply "waste not want not" but kitchen crafting at its finest. The Back To Basics Living Bundle will be available through midnight tomorrow and includes 73 homesteading, self-reliance, DIY, and preparedness resources plus about a dozen bonus offers. You can choose online access to download the bundle for $29.97, the flash (thumb aka USB) drive option for $54.97, or both for $59.97 (one for you and the other as a gift). BONUS: If you buy it through my blog, I'll gift you with your choice of one eVolume from my The Little Series of Homestead How-Tos. After you place your order simply email me at 5acresandadream @ mail. com, and let me know which one you'd like. I'll send you a link to download a free copy. Tomorrow is the last day the bundle will be available, so I'll touch on some of the eCourses, memberships, and other extras included in the purchase price. Yesterday I reviewed a few of the preparedness books in the Back to Basics Living Bundle. Today I'd like to share the following for those of us trying to be less dependent on the grid and a high-tech lifestyle. 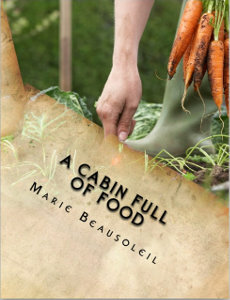 A Cabin Full of Food by Marie Beausoleil could have been reviewed in my food preservation and storage book review post. While I fully agree with investing in a fully stocked pantry, I also believe that our best preparedness tool is our lifestyle. This off-grid author focuses not only on preparedness, but on a lifestyle of simple, local, sustainable living. I really like that. The author admits that this book is not geared toward beginners, and it's what I would call next-step information for those of us wanting to further develop our skills as well as our pantries. The introduction includes a harvest and preservation calendar plus an extensive glossary of terms. The first section is "Make Your Own," and details things like vanilla bean syrup, lemon curd for short term canning, and how to make a ginger bug and fermented ginger beer. "Herbs and Spices" lists a well-stocked spice shelf and includes recipes for making your own allspice, pickling spice, seasoned salt, etc. "Grains" covers a variety of grains and how to store long term, plus recipes such as a mixed coffee substitute and war yeast bread. "Vegetables" has intriguing recipes such as Mixed Vegetable Cake, Rumblethump, and a vegetable spread to can. Then there's "Legumes," "Dairy and Eggs," "Trees and Fruit," and "Meat," and that's just the tip of this 349-page iceberg. Currently available from Amazon.com. Some of you might already be familiar with Tammy Trayer through her podcasts and webinars. Being a bibliophile myself, this is more up my alley. 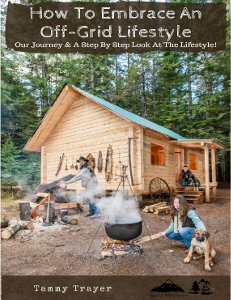 How To Embrace An Off-Grid Lifestyle begins by telling her story, discusses what it means to live off the grid, and then helps the reader evaluate whether the lifestyle is right for them. She looks at evaluating property, how to begin, and how to evaluate your current power consumption. The chapters which follow discuss everything you need to consider: tools, heating, water, sewage, appliances, laundry, cooking, baking, food growing and foraging, food preservation and storage, living without refrigeration, sickness and injury, protection, plus phone and internet. Finances, budget, and making money while homesteading round out this excellent book. The Back To Basics Bundle will be available through January 22 and includes 73 homesteading, simple living, and preparedness resources, plus about a dozen bonus offers. You can choose online access to download the bundle for $29.97, the flash (thumb aka USB) drive option for $54.97, or both for $59.97 (one for you and the other as a gift). BONUS: If you buy the bundle through my blog, I'll gift you with your choice of one eVolume from my The Little Series of Homestead How-Tos. After you place your order simply email me at 5acresandadream @ mail. com, and let me know which one you'd like. I'll send you a link to download a free copy. Tomorrow I'll review three books in the categories of DIY and frugal living. It seems that more and more people are becoming aware of the need to be prepared. Not only because of economic and political uncertainties, but for times of joblessness or natural disaster when resources are slim to none. Being prepared for hard times only makes sense, and the Back To Basics Living Bundle has some good offerings on this subject. 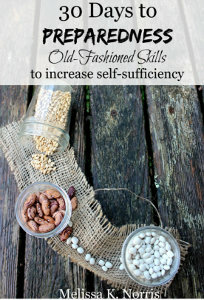 There are several really good preparedness plans in the bundle, but for those just getting started I especially like Melissa K. Norris's 30 Days to Preparedness: Old-Fashioned Skills to increase self-sufficiency. It starts with a preparedness checklist, and is divided into weekly sections. Week 1 discusses things to keep in your car, alternative light sources, keeping warm without electricity, and an introduction to bulk food storage. Week 2 addresses food storage mistakes to avoid, storing and purifying water at home, growing and foraging for food, seed saving, and introduces raising backyard chickens and other animals for meat. Week 3 discusses home butchering of meat, dehydration, canning, choosing a grain mill, and sourdough starter. Week 4 gets into cooking without power, starting a fire without a lighter or matches, bartering, herbs, and old-time natural remedies that work. This book doesn't claim to take you to full preparedness, but between it and the rest of the B2B Living Bundle, you will have the tools and information you need to get there. 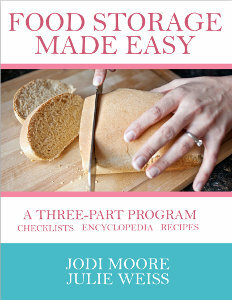 Food Storage Made Easy: a three-part program by Jodi Moore and Julie Weiss obviously focuses on food preparedness. It can help the beginner get started, as well as help the rest of us evaluate, organize, and fill in the gaps. Part one includes weekly checklists for goal setting. The checklists give you things to do, things to buy, and recipes to try (included in the recipe section). Part two is an encyclopedia which covers emergency preparedness, shelves (where to put it all is something one doesn't usually think about at first), water, the 3-month supply, and long term planning. It goes on to cover grains, legumes and meats, baking ingredients, fruits and veggies, comfort foods, and non-food items. Part three is a huge selection of recipes utilizing the foods you've stored in your pantry. 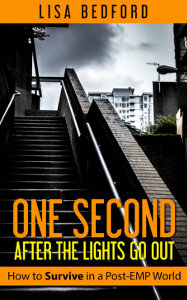 While the two eBooks above are good examples of general preparedness, One Second After the Lights Go Out: How to Survive in a Post-EMP World by Lisa Bedford addresses preparedness for the extreme. Most of us would like to think that an electro-magnetic pulse (EMP), coronal mass ejection (CME), or cyberterrorism are simply the stuff of books and movies and therefore highly unlikely. The author begins by explaining what our power grid is, how it functions, and what experts say about the actual likelihood of extensive damage to it. By assuming a worst case scenario she takes you through the consequences of such an event and actions you can implement to be better prepared. Such a catastrophe may seem sensationalistic, but the information in this book is very common sense and practical. If you're prepared for this, you'll be prepared for almost anything. The Back To Basics Bundle will be available through January 22 and includes 73 homesteading, self-reliance, DIY, and preparedness eBooks, courses, plus about a dozen bonus offers. You can choose online access to download the bundle for $29.97, the flash (aka thumb or USB) drive option for $54.97, or both for $59.97 (one for you and the other as a gift). Tomorrow I'll review two books on low tech and off-grid living. This year's Back To Basics Living Bundle is truly a gold mine of information on food preservation and food storage. It's a comprehensive collection of information covering canning, dehydrating, fermenting, freezing, and pickling, as well as planning and pantry organization. You'll find forms, checklists, and recipes included. It was hard to pick just a few to review for this post. 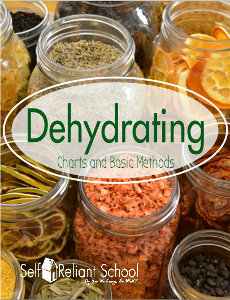 Jennifer Osuch's Dehydrating–Charts and Basic Methods caught my eye because I've pretty much fallen away from dehydrating. However, I've recently learned a technique which has renewed my hope for drying more foods. (I'll tell you about that technique in an upcoming post.) Jennifer does an excellent job covering the basics in this book, including foods like watermelon, berries, corn, tomatoes, citrus fruits, and odorless onions; how to make powders including pumpkin flour, how to make "quick cook" dried beans, plus an introduction to meals in a jar. The charts include conversion charts which give pre-dehydrated weight and volume, method of preparation, and dehydrated weight and volume for an extensive list of vegetables. The time chart includes temperatures and drying times based on humidity. Humidity makes a difference! As a bonus you get a printable page to create your own Dehydrating Journal plus printable labels. Many of you know Patrice Lewis from Rural Revolution. 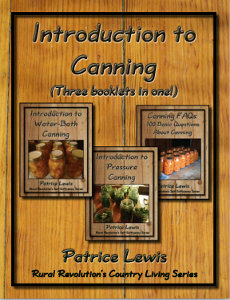 This year's B2B Bundle includes her Introduction to Canning, which is actually three booklets in one: Introduction to Water-Bath Canning, Introduction to Pressure Canning, and Canning FAQs: 100 Basic Questions About Canning. Includes a thorough discussion of safety and equipment, altitude charts, tips, and how-to basics for canning fruits, vegetables, and meats. The FAQ section discusses alternative heat sources, what not to can, and trouble shooting. There are quite a few other food preservation and storage offerings, but the last one I'd like to mention is Oh Lardy’s Guide to Fermenting Fruits & Vegetables by Kelly Liston and Tamara Mannelly. 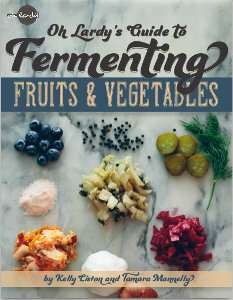 Regular readers of my blog know that I am a fan of fermenting, and for me this guide is a next step into more fermenting adventures. It covers basics for vegetables and fruits, equipment, health benefits, how to use, and answers common questions. The recipe section includes a nice variety of recipes for fermented veggies, sauerkrauts, fruits, drinks, dips, condiments, salsas, and salad dressings. It also includes a nice list of resources. The Back To Basics Living Bundle will be available through January 22 and includes 73 homesteading, self-reliance, DIY, and preparedness resources plus about a dozen bonus offers. You can choose online access to download the bundle for $29.97, the flash (thumb aka USB) drive option for $54.97, or both for $59.97 (one for you and the other as a gift). Tomorrow I'll review three of the bundle offerings on preparedness. When I was a senior in high school I took an aptitude test. I scored highest in music and home economics, lowest in police work and sales! As you can imagine, that means that trying to promote anything (most especially my own books) is truly difficult for me. The Back To Basics Living Bundle folks put together a really nice marketing package for their affiliates, but instead of presenting you with a more typical sales appeal, I'm going to do what feels comfortable for me, i.e. a series of book reviews from this year's bundle. So from one book lover to another, here are some of the B2B books that I really enjoyed. 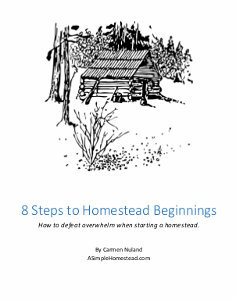 There are many homesteading resources in the bundle, and for those who are looking to get started, this one by Carmen Nuland is a really great little book. 8 Steps to Homestead Beginnings: How to defeat overwhelm when starting a homestead talks about the reasons for homesteading and then helps you develop a vision for your future homestead. It takes you through evaluating your resources, planning, goal setting, getting started, identifying obstacles, tracking expenses and income, and review. It includes all the things that need to be thought through in order to create a plan and take the first steps toward success. For those of you interested herbs and natural healing, Kami McBride's How To Make Healing Herbal Oils is a really nice addition to the bundle. 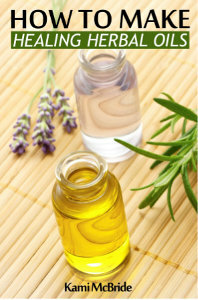 In it she introduces the benefits of using herbal oils, and then teaches you how to make your own. It starts with the basics of making infused oils with either fresh or dried herbs, then shows you how to make two useful oils from lavender and comfrey. She details her seven favorite herbs for infused oils, plus gives recipes for making a variety of healing blends: Aches and Pains, Bumps and Bruises, Relaxation, Scrapes and Scratches, Headache Oil, Healing Bath Oil Blend, Luxury and Massage Oil Blend. She also includes a chapter on preserving your oils, plus a list of resources. These parent guides help you adapt your own homestead resources to a variety of grade levels and subjects: math, science, geography, language arts, art, home economics. Each booklet includes a vocabulary list and resources. 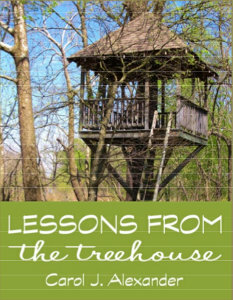 My favorite in the series is Lessons from the Tree House. It uses the unschooling approach which is such a natural fit with homesteading. In her introduction, Carol cites a work which states that American children typically only get 30 minutes per week in unstructured outdoor time, whereas they spend over 30 hours each week in front of some kind of electronic screen. She writes, "Those sobering statistics compelled me to go outside and take pictures of their fort for future scrapbooks. While out admiring their work, I couldn't help but think of all they learned while working on this project." Divided into The Design Phase, The Building Phase, and The Enjoyment Phase, this little eBook helps parents develop both academic as well as life skills in their children. I only wish it was available when I was homeschooling my kids! 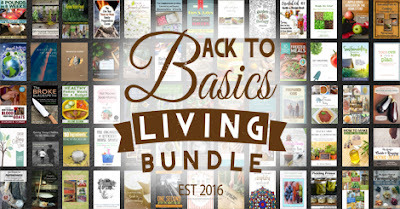 The Back To Basics Living Bundle will be available through January 22 and includes 73 homesteading, self-reliance, natural living, and preparedness resources for $29.97. Tomorrow I'll review three really good books from the bundle that deal with food preservation and storage. The 2017 edition of the Back To Basics Living Bundle is up, running, and on sale now through January 22nd! If you're ready to jump to it, click here. If you'd like more information, read on. Click here and scroll down for a complete list of titles and authors. 12 bonus offers for a variety of products and services of interest to homesteaders, gardeners, and preppers. Click here (and scroll down) for a complete list of bonus offers. $29.97 price for $814.94 worth of books, courses, and memberships. (Online access to printable PDF downloads). $54.97 for the complete collection on a thumb (flash) drive. This makes it a great way to give it as a gift. Of course, no one would buy every single book individually, so the question becomes - is there enough in the bundle of interest to me personally to make it worth it? The answer to that question will vary, but I think there's enough for you to at least consider it. Over the next week I'm going to do a series of book reviews to give you a better idea of what's included in the bundle. That way you can decide for yourself whether the cost is worth it to you. I'll start tomorrow with a sampling of books on homesteading, herbal medicine, and homeschooling. Also, as a participant I'm authorized to offer my own bonus. If you purchase the bundle through my blog, I'll gift you with your choice of one e-volume from my The Little Series of Homestead How-Tos collection. After you place your order simply email me at 5acresandadream @ mail. com, let me know which one you'd like, and I'll send you a link to download a free copy. (Since my How To Make Amish Whitewash is already included in the bundle, you'll want to choose something else.☺). Do go check the bundle out here. You are likely familiar with a number of the authors. And please come back tomorrow for the beginning of my book review series. This time of year is good for working on some of our big, one-time-and-then-they're-done projects. The results from getting the front bedroom window replaced and getting up the new siding on the front porch were pretty motivating, so Dan was immediately ready to move on to the next house project on the list - the front gable ends. I'm not sure why there are two gables except as a decorative feature. Dan and I differed on how to treat these. He likes the contrasting shake look, but for our house, I didn't agree. I do like that look, but from a design point of view, too much variety in color and texture can result in a cluttered or incongruous look. Our house is small, and as part of the whole the front porch is only a small piece of the visual picture. A good visual design has a primary color and texture, with smaller contrasts to add interest. I felt that the porch and gable ends should work as a unit, not compete for the viewer's attention. Dan and I have some simple "rules" for decision making in our house upgrading and remodeling. If we both like the same idea, we go with that. If one really likes an idea but the other has no strong opinion, we go with the preferred idea no matter whose it is. If we strongly disagree, we continue to explore options. In this case, we researched materials and cost for both ideas. When it worked out to $250 for shakes versus $50 for the siding, the question was settled. That doesn't include labor, for which installing shakes would be more labor intensive. One thing we've noticed during the creative process is how easy it is to get elaborate with our ideas. We try to analyze projects the way I described in my "The Time To Benefit Ratio" post, but sometimes we indulge in a splurge, like the tin ceiling for the kitchen dining nook. Other times, practicality wins out, especially when we put it in perspective; we have a long list of projects and don't want to get so involved with any of them as to drain all our time and resources. To add a bit of decorative interest I bought this octagonal gable vent. I found it on eBay. It's handcrafted of western red cedar, and was less expensive than the smaller plastic job available at Lowes. Extra bonus was free shipping. It will compliment the octagon stained glass window in the master bath. I'll paint it white before it's installed. "Poor man's fertilizer," Father called such a snow, and he set Royal to plowing it into all the fields. It carried something from the air into the ground, that would make the crops grow. We were blessed with four inches of poor man's fertilizer over the weekend. I'm saying "blessed," although I'm sure those of you with more than enough are thinking of it as anything other than a blessing. Our chickens didn't think it was a blessing and refused to come out of the coop. The goats weren't impressed. Only the ducks were willing to venture out in it. On the Thursday and Friday before, I planted two of our pasture areas. 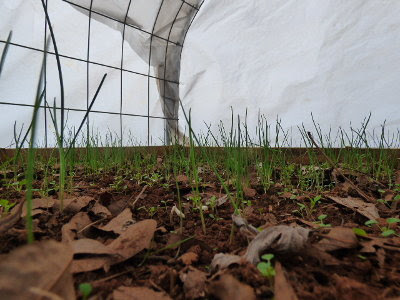 I planted the buck pasture in a deer and turkey forage mix of wheat, oats, and Austrian peas. I planted one of the doe pastures in winter wheat. It's been gradually melting, although the temps have barely gotten above freezing. A warm-up is predicted by the end of the week so it should all be gone by then. I just hope it was enough cold to hopefully help reduce next summer's insect population. We seem to have more but problems after a mild winter. Will we get more snow in the days and weeks ahead? Hard to say. January and February are typically our coldest months, although we've gotten snow as late as March. I reckon we'll just take it as it comes. The hoop house is hoopening. Ha ha, pretty corny, I know. Dan thinks I don't have a corny bone in my body, but we just showed him, didn't we? 😉 Actually, he's right. I'm too analytical to be corny. Garlic. I planted carrots here too, but they have yet to germinate. them this winter because last summer was too hot and dry. Also I have turnip and collard seed in the ground, but like the carrots they have yet to make a showing. Most of the action is in the hoop house. 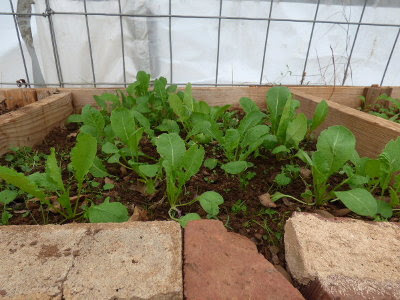 There isn't much to harvest at the moment, except for a few baby greens leaves for salad. 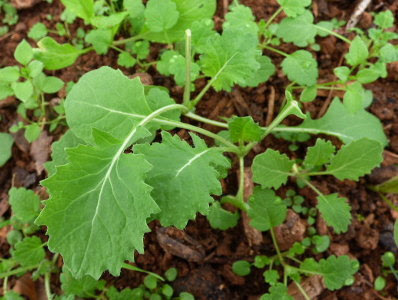 Kale with some volunteer chickweed. Radishes aren't ready to harvest yet but they're coming along. I'm also getting Jerusalem artichokes from the artichoke bed. I feed these to the goats and we like them lactofermented. These weren't terribly prolific due to lack of rain last summer, but at least they survived. 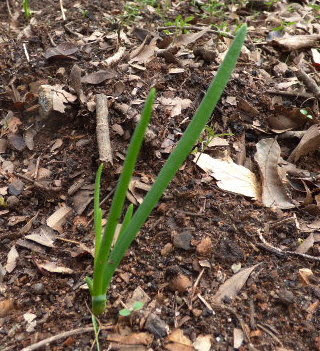 ... are now baby garlic plants. Weather permitting there is plenty to do. This is last summer's green bean and cantaloupe bed. It has a 6-inch layer of wood chips with wiregrass growing through. Whenever I blog about my wiregrass problems, someone mentions the "Back To Eden" film in the comments. I always mulch as heavily as I can, but last summer was the first time I had enough wood chips to mulch large sections of the garden. 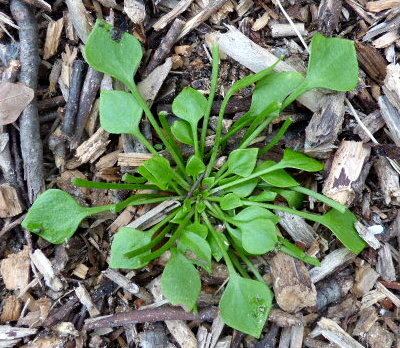 Because wiregrass indeterminate (keeps on growing like a vine) it grows right up through thick mulch or into a raised bed and keeps on going. I've pulled strands of wiregrass that measure five feet and more. Every so many inches it sets down more roots and thus entrenches itself everywhere. It grows the same way underground and can strangle out anything else growing there. Soil prep in those previously mulched areas involves raking the wood chips back and then digging out as much of the wiregrass as I'm able. It's got me thinking that the wood chips created more work instead of making things easier. the Jerusalem artichokes to be reused and the wiregrass dug out. Why not just continue to add mulch? 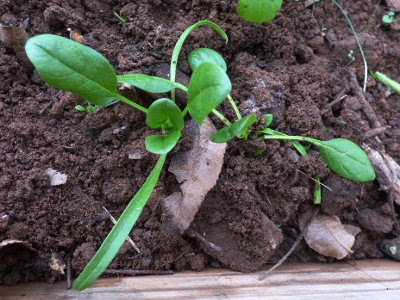 Because seeds need to come into contact with soil to grow. They won't grow in pure mulch. I already have about six inches of mulch down; the more I add the farther we are from the soil. In the house we just finished the last of the tomatoes I picked before first freeze. I have a few peppers left which I'd better chop and pop into the freezer. 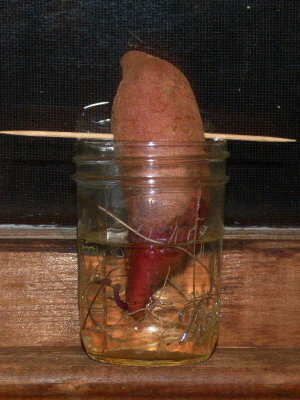 Also, my lone hope sweet potato is coming along. No leaves yet but it's growing roots. And oops, I see it needs more water. Seed catalogs are arriving daily, so I'll hit those during this bout of frigid, icy weather. Those catalogs, a cozy fire, and a cup of something warm to drink make a great combination. So what gardening activity is going on in your part of the world?